Ebbtide is a beautiful 4 bedroom villa situated on a quiet sandy beach. The accommodation has a large lounge/dining room (35 ft.) overlooking the Caribbean, patio off the lounge with barbeque and garden furniture, 4 air conditioned bedrooms with bathrooms. Large kitchen. Full maid service (6 days). Fabulous well kept gardens leading directly on to the beach. Night Security all included in the price. LOCATION: About 4 miles out of Bridgetown, 3 1/2 miles to Holetown and 14 miles to the airport. Notes: Ebbtide is a 2 minutes walk from most amenities. Supermarket, chemist, doctor, etc. Also on main bus route. All water sports can be arranged. Magnificent Coral Reef within 2 minutes swim from beach. Ebbtide is a great place to party or chill out in a hammock under the palm trees in picturesque gardens which lead directly onto the golden sands. 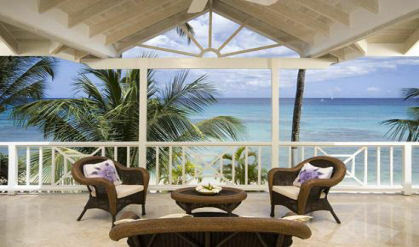 A very quiet peaceful area of Barbados but with easy access to many of the Islands best restuarants and night life. Contact us to book this classic beachfront villa.